We made 12 pints of dilly beans the other day with the first harvest of the beans. All three colors (green, yellow and purple) had about the same yield so far. The plants are too close together, which is a mistake we always make, but the bed is pretty weed-free because of that, but it’s a pain to search the jungle for all the beans. We missed the first zucchini sitting there on the black plastic and it was almost bowling-pin size, but still quite tender. We sliced it up and put it in the dryer on Wednesday. Today we started a bucket of sauerkraut. We need to get the cabbage out of there so we can plant that bed with another batch of beans. The tomatoes continue their epic growth. I’ve never in my life, anywhere I’ve lived, had tomatoes like this. There’s lots of fruit set, so I don’t think it’s a too much nitrogen situation. We’d like them to ripen now please, but we feel that way every year. We were behind on the peppers and it shows. They’ve finally settled in and taken off, but they’re weeks behind the tomatoes. They’re the second batch that Lisa started. The first one had poor germination, and then got eaten by mice in the basement. Still, given our pepper track record, we’re getting better there too. The sweet potatoes are doing well too. It’s a perfect year to try them with all the heat. We’ve been watering as the well can handle it, and I picked up a pump to throw down the old dug well that’s out there, assuming there is water there. 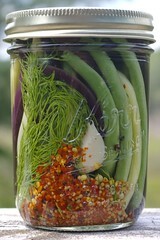 This entry was posted in Beans, cabbage, Peppers, Tomatoes, Zucchini. Bookmark the permalink. Post a comment or leave a trackback: Trackback URL. I like your multi-colored dilly beans! Yum. What do you do with your dehydrated (dried?) zucchini slices? I store them in bags that I’ve vacuum sealed in the pantry, and then open them one at a time and transfer to a canning jar with a freezer lid. I throw them frozen into soups and stews. I like the resulting texture even better than fresh ones, and I like zucchini. 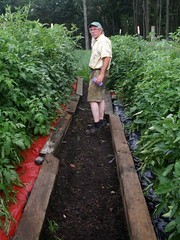 We’ve had good results with plastic mulch for our hot (like subtropical) weather crops — tomatoes, sweet potatoes, peppers. Supposedly tomatoes like the red plastic more than black for some reason, but we’ve also heard (after we bought the more expensive red stuff) that that doesn’t apply here in the northeast. Even on a cloudy day, the soil temperature is a couple degrees higher than bare ground, which is just what those crops want.